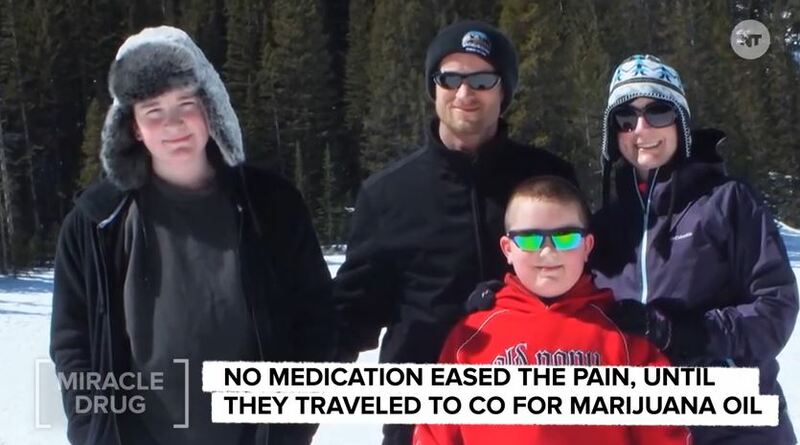 In March, one mother traveled to Colorado to get a bottle of cannabis oil in hopes of easing the agonizing pain her 15-year-old son has lived with for the past three years. What she calls a mother's instinct may land her in jail, reports CBS News correspondent Adriana Diaz. "I broke the law, but I did it to save my son," Angela Brown said. "He's the shell of himself," Angela said. "He's in so much pain, and that causes depression." With depression came daily migraines, muscle spasms and uncontrollable outbursts. "I cry like every day before I go to bed," Trey said. And the pain is intense. "Like my brain is about to blow up, cause there is so much pressure," he said. To try to ease his pain, Trey's parents tried 18 different medications, but little helped. Angela believes some of the drugs' side effects even made her son suicidal. But through out it all, she's tried to be as positive as possible. Desperate, she began researching the benefits of medical marijuana. The family drove to Colorado and obtained a bottle of cannabis oil. It's legal there, but not in Minnesota. Angela said after a few drops, Trey's pain melted away. "It was a miracle in a bottle," she said. But the miracle didn't last. "It stopped the pain and stopped the muscle spasms," Trey said. "It was helping me go to school until it then got taken away and then school was really hard again." It was taken away when his teachers asked why he was doing better in school. "I said 'Well, I gave him an oil that we'd gotten from Colorado,'" Angela recalled. "'It's derived from a marijuana plant.' And then you could feel the tension in the room." A week later, the sheriff's department confiscated the oil and county prosecutors charged Angela with child endangerment and requiring child protection. If convicted, she could face up two years in prison and $6,000 in fines. While she recognizes the substance is illegal in Minnesota, she defended herself saying it's "not illegal in other states." CBS News reached out to the county prosecutor, law enforcement and Trey's school district. All declined requests for an interview citing the on going case. If Angela does go to jail, she fears most for her children. "Who would take care of my kids?" she asked. "My boys are mama's boys." As much as they need her, she admitted she needs them just the same. In May, Minnesota became the 22nd state to approve specific forms of medicinal marijuana. But the law doesn't go into effect until next year. The Browns said they can't afford to wait.